‘They have vanished’, wrote Aldous Huxley of the Gonzaga; ‘they are as wholly extinct as the dinosaur’. And yet here we are this evening, singing the praises of a Gonzaga. Of all the Gonzaga, it was to be one of the most short-lived who was to be granted the most impressive reign – not merely a reign of some span of years in this world but rather imperishably in aeternum. In the novitiate he had to be instructed to pray less and refrain from such vigorous mortifications as he had previously imposed on himself. He was noted for his oft repeated desire for an early death but this was more than matched by his eagerness to take on the most menial tasks possible in the novitiate such as sweeping the cobwebs off the ceiling. In the early months of 1588 Aloysius was admitted to minor orders. The following year the plague broke out in Rome, the saint’s first biographer recording, ‘Verily it was a horrible thing to see the dying creeping to the Hospitals, stinking and loathsome, and sometimes to behold them giving up their last breaths in corners, or falling down dead at the foot of some pair of stairs.’ The Jesuits opened up a hospital for the plague victims and Aloysius asked to be allowed to serve there. He nursed and instructed them, begged for food for them throughout the city and saw some of his confreres die from the disease. He continued to devote himself to God and the care of the sick until he succumbed to the disease himself, dying at the age of twenty-three with the Holy Name of Jesus on his lips. He was beatified just fourteen years later in 1605 by Pope St Pius V and canonized in 1726, being declared the patron saint of young students three years later and, in 1926, Pope Pius XI pronounced him the patron saint of all youth. After his death, many paintings and statues of St Aloysius were created, one such painting, impressive not least for its size, now hangs in the Metropolitan Museum of Art in New York. It is a huge altarpiece by the Bolognese artist, Guercino. 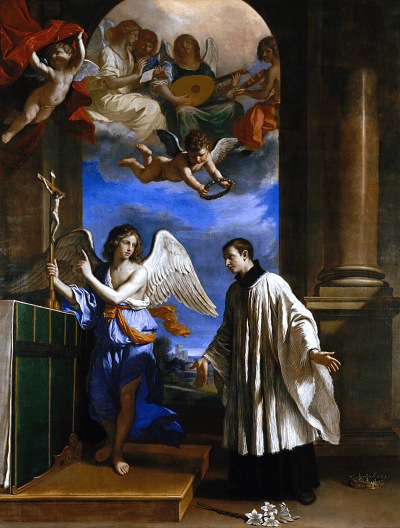 The work, entitled ‘The Vocation of St Aloysius Gonzaga’, was originally commissioned in 1650 for the Theatine church of Guastalla by Duke Ferrante III Gonzaga (1618–1678). Guercino depicts St Aloysius much like contemporary portraits of him painted from life – slim face, long nose, like many of his family, but the saint is wearing a black Jesuit cassock and a voluminous white surplice. The moment depicted, in allegory, is that of St Aloysius’ decision to heed his heavenly call. As we look at the painting it is as if we were standing at the side of a chapel, looking across the front of the altar to an arch, through which can be seen the countryside and the strikingly blue yet cloudy Italian sky. Guercino depicts St Aloysius standing, on the right of the picture, before the predella of the altar. Upon the predella stands an angel of similar height and stature to the saint. The angel is dressed in blue, an orange sash, around his middle. Above the two figures we can see more angels, one playing a lute, another a viol, two more singing from a manuscript. Through the arch, in the midst of the countryside, we can see the family’s principal castle and, discarded by the Saint’s feet, is the coronet of the marquis. These symbolize St Aloysius’ renunciation of the worldly glory and power that was his birth-right. He had the courage to take a deliberate decision to follow his God given vocation. Despite the prolonged anger of his father and family who did all that they could to persuade him to remain with them, St Aloysius would not utter the words to God ‘I will not serve’, it was not better, thought he, “to reign in [Castiglione], than to serve in Heaven.” (Cf Milton Paradise Lost Book 1). He wanted to give his life to the Church, not his bones – he heard the call of Christ and his response was decisive, bold, iron-willed. This central image of Guercino’s painting recalls the saint’s love and respect for the angels – one of St Aloysius’ few writings to survive is a meditation on the angels – those mighty spirits of praise and spiritual warfare, those messengers of God, one of whom has been given to each of us ‘to light and guard, to rule and guide’. The image also recalls St Aloysius love of the Cross of Christ, central for him in prayer, particularly as he was dying, for he could strive in his sufferings to follow his Divine Master in His humility and sacrificial love. Aloysius knew the urgency of responding to God’s call for ‘Time, the subtle thief of youth,’ (Milton, Sonnet 7) is ever moving on. Some hearing these words this evening are called now to offer themselves to be priests, brothers or nuns – follow St Aloysius’ example! Some are called now as lay men and women to offer yourselves to this church’s evangelizing mission – follow St Aloysius’ example! Some of us are called now to follow with renewed conviction the example of St Aloysius in our prayer and our renunciation of our self-will to conform ourselves afresh to the will of the Lord – on this feast day, let us follow St Aloysius’ example. One important detail of Guercino’s altarpiece have I, so far, left out: above the saint hovers a cherub ready to place on Aloysius’ head a different sort of crown from that which he had laid aside. It is the crown of sanctity, made of laurel leaves for victory and white flowers for purity, a very singular halo for a most singular saint. But now I must leave my praises of your patron saint as we turn again to the Lord. Let St Aloysius speak the final words, his final words addressed to his mother. As he faced death he wrote to her of the fulfilment of his and her vocation, praying that ‘our parting will not be for long; we shall see each other again in heaven; we shall be united with our Saviour; there we shall praise him with heart and soul, sing of his mercies for ever, and enjoy eternal happiness.’ So may it be.